TON is an acronym for “The Other Ninety-Five,” which is derived from the fact that 95% of all residential construction projects in the US are done without the assistance of a design professional. 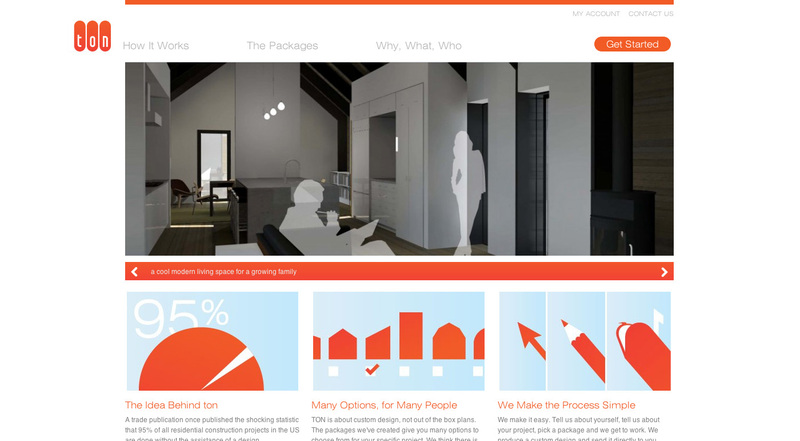 TON aims to fill that gap by offering custom architectural designs through packages on its web site—a cross between a product and a service. The architect-founders wanted a modern symbol to reflect their design sensibilities, but also wanted a touch of “capital M” Modern—a nod to classic Modern masters like George Nelson and the Eameses. This logo design achieves that through friendly geometric shapes surrounding custom geometric—almost modular-feeling—letterforms. We designed their web site, too.